Imphal, September 13 2018: Village authority of Ringui in Ukhrul district has donated 600 acres of land to Forest department for protection of Environment. Lauding the gesture of the villagers Forest and Environment Minister Th.Shyamkumar said that village authority of Ringui has set an example on their commitment to save the environment. "God created different places and environment but human race exploited it for their own benefit", Shyamkumar said. He said the Forest department is committed to save the environment at different locations of the State and the department respects the villagers of Ringui who have donated the land for conserving the environment. 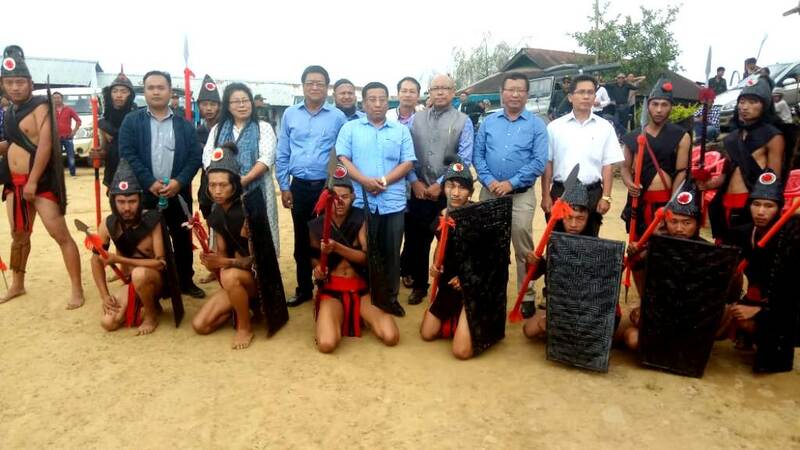 The Forest and Environment Minister Th.Shyamkumar said the above statement during an inaugural function of a community hall at Ringui village at Ukhrul district today. Shyamkumar appealed the people to protect the forest and environment and also to extend their support to the authority of the Forest department in preserving the natures' gift.
" Officials of the Forest department is visiting nooks and corners of the State to spread awareness to conserve the environment and combat the climate change which is the biggest threat faced by the world, but without the support of the villagers it will be a hard task for the official in saving the environment. Ringui village is a plastic free village and it has official dumping site. The Forest Minister was impressed to learn it. As part of the function, a CD containing Ringui Horei song was released and a documentary was also shown to the audience. Land donors were also felicitated at the function.